↑ The name Mestrius or Lucius Mestrius was taken by Plutarch, as was common Roman practice, from his patron for Roman citizenship in the empire; in this case Lucius Mestrius Florus, a Roman consul. ↑ Aubrey Stewart, George Long. "Life of Plutarch". Plutarch's Lives, Volume I (of 4). The Gutenberg Project. สืบค้นเมื่อ 2007-01-03. 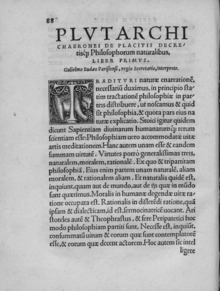 ↑ "Plutarch Bio (46c.-125)". The Online Library of Liberty. สืบค้นเมื่อ 2006-12-06. หน้านี้แก้ไขล่าสุดเมื่อวันที่ 6 เมษายน 2559 เวลา 21:21 น.